Description: Completely & tastefully remodeled top floor end unit condo on miracle mile w/ outstanding east bay views. Highly sought after & rarely offered complex, le grande chateau ii. 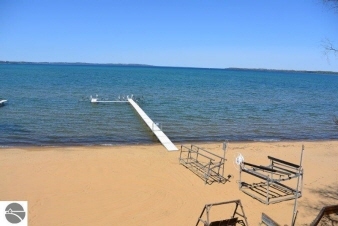 Incredible sugar sand beach & new dock. Exceptional sunset & sunrise views. High quality finishes, plantation shutters, hickory floors & cabinets, beamed ceiling, open floor plan. Solid core shaker doors. Board & batten detail on walls .Bathrooms are both exquisite one marble, one w/ glass & ceramic tile. Covered balcony, 1 car garage w/ storage. Area of restaurants, adventure park, tart trail. Weekly rentals allowed. Come enjoy the beach life in popular tc!